1. The number of Article 112 cases is inextricably linked with the political context. During periods of widespread protest and intense political analysis, a large number of cases arise. One possible reason may be that the monarchy is heavily cited as part of political struggle, such as by those who claim to struggle for the king. In addition, the monarchy has entered political conflict via those who allege that others wish to overthrow the monarchy, such as those claimed to be part of the Finland Plot or included on the chart of those who wanted to topple the monarchy. In addition, one of the reasons cited for launching the 2006 coup  was alleged defamation of the king; some criticism of the coup was also related to the monarchy. 2. During the first two years following the 2006 coup, those targeted tended to be semi-well-known figures opposed to dictatorship, including public speakers, activists, and politicians. Subsequent cases tended to target ordinary citizens, largely due to the expansion of the role of social media. The majority of cases involve Facebook posts and have resulted in very harsh punishments as each post is treated as a separate count. The harshest punishment to date was a 70-year sentence given to Wichai  for 10 Facebook posts in 2017. In 2007, there was an attempt by the National Legislative Assembly (NLA) to revise the law to extend the its protection to privy councilors and other members of the royal family. This amendment was ultimately not passed. 3. During 2009-2010, online witch-hunts expanded rapidly. One prominent Facebook page was that of the “Social Sanction” group, or SS. The Thai Netizen Network (2011) reported that this page reported personal information of more than 40 individuals its organizers believed to have defamed the monarchy. Many of those named lost their jobs and some were prosecuted. The phenomenon of online witch-hunts declined and then returned in a more virulent form following the death of Rama IX. Following the circulation of information online, mobs surrounded homes or police stations to demand that charges be brought against their targets in Chonburi, Phuket, Ko Samui, and Phang-nga. 4. During 2010-2012, the rising number of cases in the news led to domestic organizing to reform the law. This period also witnessed a clear increase in international pressure. The case of the death of Amphon Tangnoppakul, or Ah Kong, prompted both domestic and international concern. There were academic, cultural and social campaigns, including the repeated collection of signatures to amend or revoke the law. For example, the Campaign Committee for the Amendment of Article 112 sought to propose a draft law to amend Article 112. The amendment, drafted by the Khana Nitirat, contained three significant changes: a reduction in punishment, a clear stipulation of who can initate cases, and an increase in the reasons for which guilt is exempt. However, their draft law was not considered by Parliament. 5. With respect to civilian governments, there was a greater number of cases during the government of Abhisit Vejjajiva that during that of Yingluck Shinawatra. In addition, at the end of 2011, the Truth for Reconciliation Commission for Thailand (TRCT) proposed to amend Article 112 , but the goverment did not accept the proposal. 6. When the 22 May 2014 coup took place, a large number of those who once held significant political roles or offered rigorous political criticism sought asylum abroad. Simultaneously, the number of Article 112 cases quickly rose. 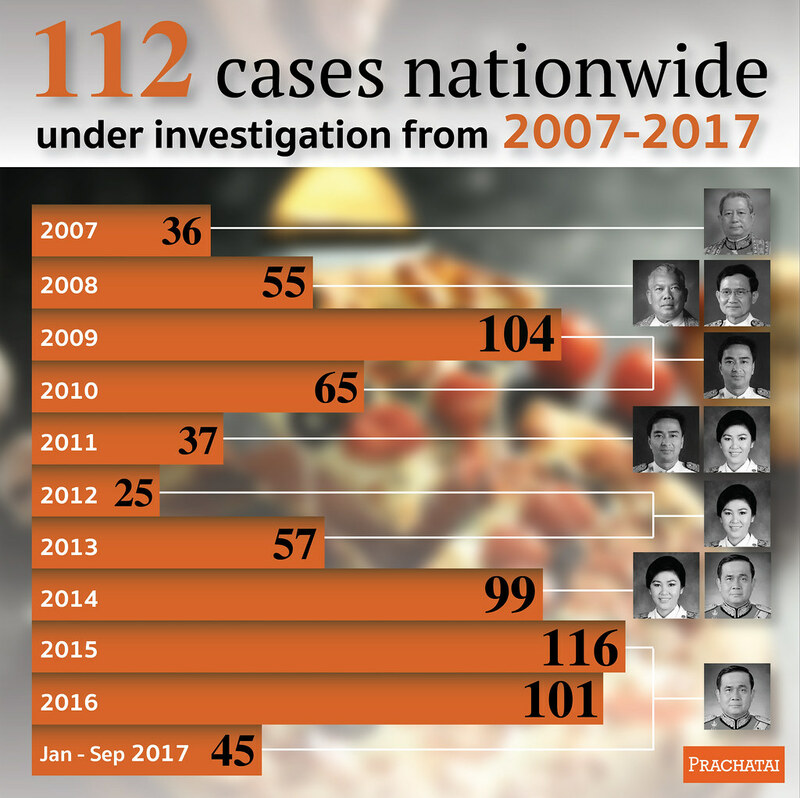 The NCPO holds the record for prosecuting the largest number of Article 112 cases in the past decade. They revived cases previously stalled at the level of police investigation and also used methods to locate evidence in contravention to usual legal principles. Since the coup, soldiers can detain individuals in military camps and carry out their own investigations for up to 7 days before transferring those accused to the police to proceed according to usual procedure. In addition, a large number of people were prosecuted in the military court system between the coup and September 2016, when Article 44 of the 2014 Interim Constitution was used to halt the initiation of prosecution of national security cases in the military court system. Up until the present, soldiers retain the authority to arrest individuals and carry out their own investigations for up to 7 days. 7. During the reign of Rama X, Article 112 cases continue to arise but have not increased. The criticism of the judicial process in these cases remains the same as in the reign of Rama IX. However, at the end of 2014/beginning of 2015, shortly before Rama X began his reign, a large number of people who served him closely were arrested and imprisoned under Article 112. Those arrested and imprisoned included Police Major Prakrom Warunprapa and Mr. Suriyan Sucharitpolwong, or Mor Yong, whose shocking and puzzling death in the 11th Military Circle Base Prison provoked questions which remain unanswered. 8. In April 2017, the Ministry of Digital Economy and Society issued an announcement unlike any issued previously. Citizens were to cease communicating with, following, or disseminating content, directly and indirectly, intentionally and unintentionally, of the following three individuals: 1) Somsak Jeamteerasakul; 2) Pavin Chachavalpongpun; and 3) Andew MacGregor Marshall. Failure to do so might lead to prosecution under the Computer Crimes Act. Then, in June 2017, there was a wave of criticism and analysis about the puzzling removal and replacement of the People’s Party plaque with a new plaque holding a different meaning. Somsak Jeamteerasakul offered extensive analysis of this event. The government could not close his Facebook account and so they instead targeted those inside the country who engaged with this analysis. Six individuals who shared Somsak’s post were arrested and held on a military base before being accused of violating Article 112 and the Computer Crimes Act and transferred to regular prison detention. They were repeatedly denied bail  and detained for the maximum of 84 days. After 84 days, all were released except for Prawais Praphanukul , a senior lawyer who has been accused of 10 counts of violation of Article 112 and 3 counts of violation of Article 116 in relation to Facebook posts. He has refused to sign court documents or otherwise participate in the court process because he does not believe that he will receive a just decision from a court operating under the umbrella of the king. He is the first person to take this kind of action. 9. The process of examining cases in the miltary court system is lengthy and the punishments are more severe than those in the civilian court system. This functions as an indirect form of coercion to compel people to confess. The Internet Dialogue on Legal Reform (iLaw) has reported that many defendants being prosecuted in the military court system have initially entered a plea of not guilty but then changed their minds, such as Samak , Thara , Wichai , Khathawut , and Ari . The majority of the total number of cases remain at the level of police investigation. A total of 254 have been forwarded by the police to the prosecutor, of which 137 cases have been ordered not to be prosecuted. There are 110 cases in which the investigation has been halted due to the inability to locate the perpetrator; these are cases in which the alleged crime has taken place online and widely-used platforms such as YouTube and Facebook continue to refuse to reveal information about their users to the police. In addition, there are 62 cases being investigated by the Office of the Attorney General (OAG) as they have taken place outside the country and the OAG holds the authority to investigate and complile evidence, and 23 cases being investigated by the Department of Special Investigtion (DSI). iLaw has noted that between the 2014 coup and the beginning of October 2017, they have been able to access and follow a total of 90 Article 112 cases  related to expression. A total of 38 of these cases are in the military court system, or 34.2%. Article 112 cases are viewed as “hot potatoes” by state officials in every agency. Therefore, the cases must be centrally controlled. Although its initial date of establishment remains unknown, from at least the end of 2009 until the present, the Royal Thai Police have operated a Committee to Examine Lèse Majesté Cases. This ommittee includes the Police Commissioner, Deputy Police Commissioner, and the heads of various other units. The primary operating strategy is that police in every locality must report the detailed facts of a case along with their opinion in Article 112 and Computer Crimes Act cases. The committee then examines whether or not a case falls within the scope of the law. All 112 cases must be examined by the committee with no exceptions made. This information is confirmed by an account of a case related to the alleged defamation of Princess Sirindthorn. Prior to the 2014 coup, an investigating official decided not to forward such a case to the prosecutor without consulting the committee. After the 2014 coup, the case was examined by the committee, which then decided to forward the case to the prosecutor. The original investigating official was disciplinarily sanctioned and transferred from Bangkok to a provincial post. He wept as he told the court of his “mistake” when he gave testimony in the case to the court as the former investigatigating official. Two primary strains of criticism in relation to Article 112 cases have been leveled at judges during the past decade. The first strain comments upon the process by which cases are examined in the courts, and include that of the primary tendency to deny bail, the exceptional cases in which bail is granted, the secret examination of cases and the severe punishments granted. The second strain of criticism instead focuses upon the judges as possessing conservative and royalist thinking. “The Courts of Justice are very cautious. Even when they make the record [of what is said during court proceedings], they are very strict. In some cases, they have to consult their boss before making the record of examination. For example, in the case of Pai [Jatupat Boonpattararaksa], we submitted a petitition for some sessions to not be examined in camera, such as those with the investigating and arresting officials. The judges had to go consult with their boss. Before issueing any orders, they had to go consult with their boss. Ultimately, every session was examined in camera. Or, with the case of the arson of the royal portraits in Khon Kaen, the court officials called the lawyers directly. This was a case that was in the news and the region [al officials] asked for the hearings to be moved up, and to have a reconciliation meeting [for the defendants to have the opportunity to confess], because it must be reported at the regional level,” Pawinee Chumsri, from Thai Lawyers for Human Rights (TLHR), observed. “What are they afraid of? Judges are human. I think that they are afraid they will be criticised by society, afraid that it will become a political matter, afraid of being criticised by head judges, afraid of a committee being set up to investigate them, afraid that the accusation will come to them ... each person then deals with his fear differently. Some are quiet. Some struggle,” Yingcheep said. No matter how one views what informs the judges’ roles, it is undeniable that the judiciary was created in a manner that has made it long-intertwined with the institution of the monarchy. During the period of absolute monarchy, the power to decide cases belonged to the king. Up until the reign of King Chulalongkorn (Rama V), the courts used to be located in various ministries and ministers expert in the Dharmasustra made legal rulings. Due to pressure from the Great Powers to have a modern judiciary, the Ministry of Justice was created in R.S. 110 (1892 C.E.) and all courts were centrally placed within it. Krom Luang Ratchaburi Direkrit (Prince Raphi Phatthanasak), the 14th son of Rama V, played an important role in setting up the Thai system of courts and laws. A few decades later, in 1932, the People’s Party carried out the transformation from absolute to constitutional monarchy and the king came to be under the constitution. Two important changes in terms of sovereignty ensued. The executive and legislative branches were to now be selected by elections of the people. But very little changed in the judiciary. This resulted in an enduring criticism that the judiciary is antiquated that has never undergone any democratic reform. Yoshifumi Tamada from Kyoto University, a long-time scholar of Thailand, has offered a compelling observation about the proximity between the judiciary and the monarchy and the traces that remain in the present. These traces include the oath of allegiance to the monarchy taken by judges, the use of the symbol of the king, and the large percentage of judges on the Privy Councils  of both Rama IX and Rama X. With respect to the constricted political context of the past decade, many legal scholars refer to Rama IX’s April 2006 speech to judges, given after many citizens called for a royally-appointed prime minister according to Article 7. This was the beginning of all courts having an increased role in political transformations and therefore unavoidably becoming both political actors and targets of criticism. In a 2017 BBC Thai interview , Jaran Phakdithanakul, a Constitutional Court judge, emphasized the factors that resulted in the expansion of criticism to every political institution in society. “The thing that we always hold to in performing our duties here [Constitutional Court] is that we do so under the umbrella of the king ... we hold the king to be Judge No. 1. This is journalistic speak for how we understand things among ourselves,” Jaran said. In 2013, within the context of the notable political role of judges after that speech, Sathit Pairoh , a former senior judge, read an open letter harshly critical of the role of the judiciary and called for the amendment of Article 112. He divided his criticism into that of rulings which continued the actions of the  coup and that of how examination in Article 112 cases reflected unprincipled actions and undemocratic thinking by judges. Discussing such delicate matters with judges is very difficult, but is not completely impossible and may aid in creating understanding. One new-generation judge who does not work on Article 112 cases views the phenomenon of these cases as understandable given the judiciary’s role in the protection of the institution of the monarchy. Judges may view these cases as those in which they must issue harsh punishments, so that the cases do not expand until they become uncontrollable. He also said that it is undeniable there is real indoctrination and emphasis placed upon working under the umbrella of the king with the judiciary. Combined with the primary strands of criminal law, which focus on deterrence, this results in punishment without suspension in cases judges deem as important and within the scope of the law. “Even though some judges hold liberal views, being inside this kind of structure for a long time affects their thinking and worldview,” the young judge said. This judge maintained the existence of judicial independence by noting that judges normally have full independence in examining and ruling in cases. But, in important cases, they will decide according to Supreme Court rulings and may consult internally with the head of the court. These are typical occurrences. Judges may go against the trend of Supreme Court rulings, but such decisions may be without effect because a higher court may later overturn them. There are many groups of judges, and with regards to allocation cases, the Chief Justice of the Criminal Court can decide to give important cases to the judges he trusts. A senior judge also uninvolved in Article 112 cases said that he did not believe that the decisions resulted from the judges being indoctrinated inside the judiciary. “Article 112 cases can be viewed as political. They cannot be viewed as not poltiical. There is defamation law for ordinary people and the institution has it as well. It is not in the law itself, but in the interpretation of the law and whether it is interpreted widely or narrowly. Criminal law must be interpreted narrowly because it restricts the rights and freedoms of the people... Therefore, there is no need to amend the law at all. It rests with those who interpret it and how they do so, and how it is enforced. It comes back to what I said about the court being an instrument of the regime. If you want to change the courts, you must have political change and make the demand for it yourself. Don’t put your faith in anyone else,” a senior judge said.